The core eudicots are an extremely large, diverse assemblage of flowering plants, with an enormous range of variation in habit, morphology, chemistry, geographic distributions, and other attributes. Based on analyses of morphology, classical systematists did not previously recognize the core eudicot group. Instead, the circumscription of the core eudicots as a clade was based on the very strong support obtained in analyses of DNA data sets (e.g., Hoot et al., 1999; Savolainen et al., 2000a; P. Soltis et al., 1999; D. Soltis et al., 2000). 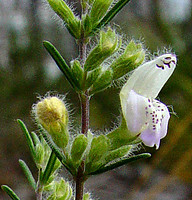 Although the core eudicot group was not originally identified based on morphological evidence, subsequent research has identified several key events that correspond fairly closely to the origin of the core eudicots, including the evolution of flowers organized in a predictable manner with a stable number of parts (e.g., flowers with parts in fives or multiples of five, a clear differentiation of sepals and petals, twice the number of stamens as petals, and a gynoecium of three to five typically fused (at least partially) carpels; Judd et al. 2002), production of ellagic and gallic acids, and perhaps the duplication of several floral organ identity genes including homologs of the Arabidopsis genes, Apetala3 (Kramer et al., 1998) and Apetala1 (Litt and Irish, 2003; reviewed in D. Soltis et al., 2005). The strongly supported core eudicot clade comprises seven generally strongly supported subgroups (D. Soltis et al., 2000, 2003; APG II, 2003): 1) Gunnerales (Myrothamnaceae and Gunneraceae; 2) "Berberidopsidales" (an order that was not recognized by APG II and comprising Berberidopsidaceae and Aextoxicaceae); 3) Saxifragales; 4) Santalales; 5) rosids; 6) Dilleniaceae/Caryophyllales; and 7) asterids. Recent studies identified Gunnerales as the sister to all other core eudicots (D. Soltis et al., 2003; Hilu et al., 2003); however, relationships among the remaining lineages are largely unresolved. The circumscription and general phylogenetic relationships of each of these major groups are discussed below. For further discussion of these phylogenetic relationships, see D. Soltis et al. (2005) and subsequent Tree of Life web pages. 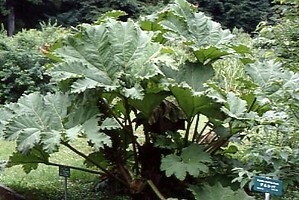 Gunnerales comprise two small families, Gunneraceae (Gunnera with approximately 40 species) and Myrothamnaceae (Myrothamnus with two species), or Gunneraceae s.l. sensu APG II (2003). This clade was identified based on high molecular support for this relationship; it had not previously been suggested on the basis of morphology because the two genera differ substantially morphologically. Gunneraceae have a dimerous perianth (e.g., the calyx and corolla each with two parts, or a multiple of two parts; Drinnan et al., 1994), as do many of the basal eudicot lineages; dimery is found in Buxaceae, Trochodendraceae, and Proteaceae (but perhaps not the Platanus lineage) and is common and perhaps ancestral in Ranunculales (van Tieghem, 1897; Drinnan et al., 1994; Douglas and Tucker, 1996). The placement of Gunnerales as sister to the rest of the core eudicots implies that the pentamerous perianth typical of most core eudicots was derived from dimerous ancestors (Ronse DeCraene et al., 2003; D. Soltis et al., 2003). 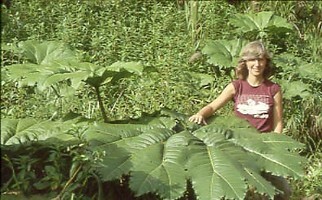 Two views of Gunnera sp. (Gunneraceae) including a view of an entire plant and the leaf of one plant (photos © Douglas Soltis). 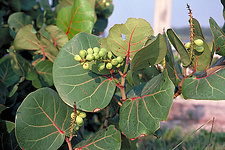 Like Gunnerales, "Berberidopsidales" comprise two small and morphologically disparate families: Berberidopsidaceae (Berberidopsis and Streptothamnus; the latter is sometimes included in Berberidopsis) and Aextoxicaceae (Aextoxicon, one species). Although this clade has not been recognized at the ordinal level by APG (hence the quotation marks), it is strongly supported by molecular data and is isolated from all other clades. Furthermore, both families have encyclocytic stomata, a rare character and an apparent synapomorphy for this clade (D. Soltis et al., 2005). Hence, future revision of the APG classification will likely recognize Berberidopsidales (see Soltis et al., 2005). 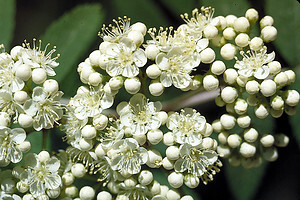 With four genes, Berberidopsidaceae plus Aextoxicaceae ("Berberidopsidales") received weak support (54%) as sister to the remaining core eudicots following Gunnerales. 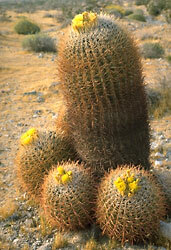 Thus, at this point the placement of Berberidopsidales should be considered uncertain. Saxifragales are a morphologically eclectic clade of annual and perennial herbs, succulents, aquatics (rarely), shrubs, vines, and large trees. 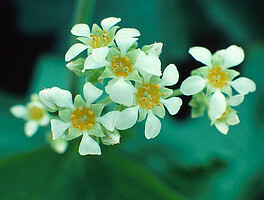 The composition of Saxifragales based on molecular analyses was not suggested in any traditional treatment (Morgan and Soltis, 1993; Fishbein et al., 2001); indeed, members of this clade were classified in three of Cronquist's (1981) six subclasses of dicots (see also Takhtajan, 1997). Possible synapomorphies for this clade include a partially fused gynoecium with two carpels, a hypanthium, and glandular leaf teeth (Judd et al., 2002); also, aspects of leaf venation and wood anatomy are similar in the woody members of the clade. The best known of the 13 families in this clade are Saxifragaceae, Crassulaceae, Grossulariaceae, Paeoniaceae, and Hamamelidaceae. Molecular studies continue to reveal new, unexpected members of this clade, such as Aphanopetalum (Fishbein et al., 2001) and Peridiscaceae (Davis and Chase, 2004), a family placed in Malpighiales in APG II (2003). The monophyly of Saxifragales is strongly supported, but the position of this clade relative to other core eudicots remains uncertain. Some analyses have placed it as sister to the rosids, although with weak support (e.g., D. Soltis et al., 2000). The simple, pentamerous flowers of many Saxifragaceae have long been thought to indicate a relationship with Rosaceae and other rosids, but whether these floral features are synapomorphies for Saxifragales + rosids or symplesiomorphies (i.e., shared ancestral features) is unclear. Additional research is needed to resolve the relationship of Saxifragales within the core eudicots (see D. Soltis et al., 2005). 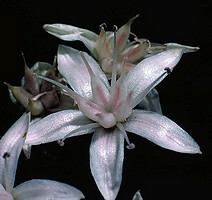 Representatives of the Saxifragales, including Boykinia major (Saxifragaceae; photo © Douglas Soltis), Fothergilla gardenii (Hamamelidaceae; photo © Walter Judd), and Crassula argentea (Crassulaceae; photo © Scott Zona). The seven families of Santalales are a strongly supported clade of core eudicots and are united by both molecular characters and morphological features associated with the parasitic habit found in most members. However, relationships of Santalales to other core eudicots are not clear, although they often appear related to the asterids and Caryophyllales + Dilleniaceae in at least some shortest trees (D. Soltis et al., 2000). Furthermore, evolutionary relationships within Santalales have not yet been fully resolved, which may be explained in part by apparently rapid rates of molecular evolution in all three plant genomes (e.g., Nickrent and Starr, 1994; Nickrent et al., 1998). However, DNA evidence has revealed that several of the currently recognized families probably do not represent single evolutionary lineages (Nickret and Malecot, 2001; APG II, 2003; D. Soltis et al., 2005). 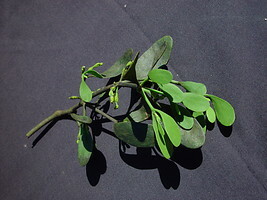 Representatives of the Santalales, including a Dendropthora opuntioides with fruits (Santalaceae; photo © Walter Judd), a branch of Phorodendron leucarpum (Viscaceae; photo © Paul Corogin), and the visible red fruits of Viscum minimum, which is growing as a parasite on Euphorbia polygona (Viscaceae; photo © Scott Zona). The core of Caryophyllales sensu APG II (2003) was considered a closely related group of families as long ago as the mid-nineteenth century (e.g., Braun, 1864; Eichler, 1876) and was formally recognized as the Centrospermae by Harms (1934) based on morphological and embryological characters. Chemical data (presence of betalains) altered the concept of core Caryophyllales (Clement and Mabry 1996). Cladistic analyses of morphological and chemical data defined the group and provided hypotheses of relationships among the families (Rodman et al., 1993; reviewed in D. Soltis et al., 2005). 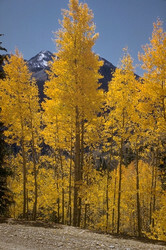 Recent molecular studies have identified a larger clade (Caryophyllales sensu APG II) that includes the Caryophyllidae of Cronquist (1981; i.e., Caryophyllales, Polygonales, and Plumbaginales) plus a number of families previously considered distantly related to Caryophyllales, including the carnivorous sundews and Venus flytrap (Droseraceae) and Old World pitcher plants (Nepenthaceae). Within Caryophyllales sensu lato, there are two large clades, core and non-core Caryophyllales (Cuénoud et al., 2002), that correspond to Caryophyllales and Polygonales sensu Judd et al. (2002). Naming the larger clade "Caryophyllales" has resulted in some confusion, and not all investigators follow the APG system. For example, Judd et al. (2002) continue to use Caryophyllales in the narrow sense and refer to the larger clade as the caryophyllids. This system has advantages and perhaps should be adopted in future versions of the APG system (D. Soltis et al., 2005). Relationships of Caryophyllales to other core eudicots are not clear, although Dilleniaceae are sister to Caryophyllales in most analyses, although generally with low support (e.g., Chase and Albert, 1998; D. Soltis et al., 2000). 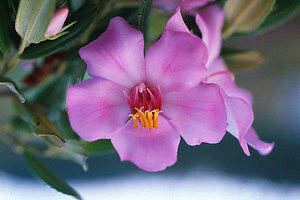 Furthermore, some evolutionary trees have indicated a possible relationship of Caryophyllales with the asterids and Santalales. 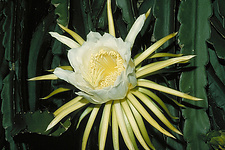 Representatives of the Caryophyllales, including the flower of the cactus, Hylocereus undatus (Cactaceae; photo © Walter Judd), a branch of Cocoloba uvifera with fruits (Polygonaceae; photo © Walter Judd), and the ornamental, Celosia argentia, in flower (Amaranthaceae; photo © Walter Judd). The rosid clade as defined by molecular data is broader than the traditional subclass Rosidae (Cronquist, 1981; Takhtajan, 1980, 1997) and encompasses many families formerly classified in the polyphyletic subclasses Magnoliidae, Dilleniidae, and Hamamelidae. The rosids comprise 140 families and close to one-third of all angiosperm species (D. Soltis et al., 2005). Clear synapomorphies for the rosids have not been identified, although most rosids share several morphological and anatomical features, such as nuclear endosperm development, reticulate pollen exine, generally simple perforations of vessel end-walls, alternate intervessel pitting, mucilaginous leaf epidermis, and two or more whorls of stamens, plus ellagic acid (Hufford, 1992; Nandi et al., 1998; reviewed in D. Soltis et al., 2005). 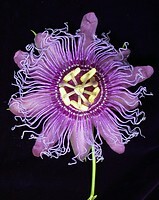 Representatives of the rosid clade, including the flowers of Sorbus aucuparia (Rosaceae: Rosales: eurosid I; photo © Walter Judd), the flower of the passion flower, Passiflora coerulea var. 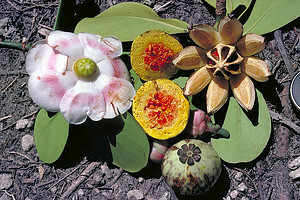 cinncinata (Passifloraceae: Malpighiales: eurosids I; photo © Sangtae Kim), and the flowers and fruits of Clusia rosea (Clusiaceae: Malpighiales: eurosids I; photo © Walter Judd). Relationships within the rosid clade are not clearly resolved. Vitaceae may be sister to all other rosids, but this relationship is not strongly supported (Savolainen et al., 2000a, b; reviewed in D. Soltis et al., 2000). Saxifragales may be sister to the Vitaceae + rosids clade, but this relationship is also not strongly supported (D. Soltis et al., 2000, 2005). Two large subclades of rosids, eurosids I (fabids) and II (malvids), have been identified through molecular analyses (e.g., Chase et al., 1993; Savolainen et al., 2000a, b; D. Soltis et al., 2000). The eurosid I clade comprises Celastrales, Cucurbitales, Fabales, Fagales, Zygophyllales, Malpighiales, Oxalidales, and Rosales. Of these, Cucurbitales, Fabales, Fagales, and Rosales form the "nitrogen-fixing clade," a clade that contains all angiosperms known to have symbiotic relationships with nodulating nitrogen-fixing bacteria (see D. Soltis et al., 1995, 1997, 2000). The smaller eurosid II clade is composed of Brassicales, Malvales, Sapindales, and Tapisciaceae. In addition to the large eurosid I and II clades, additional smaller clades have been recognized (Crossosomatales, Myrtales, Geraniales, and Picramniaceae), but their relationships to each other and to eurosids I and II are not clear. Furthermore, relationships within eurosids I and II are not fully resolved, and much additional work is needed to reconstruct relationships within the rosid clade. 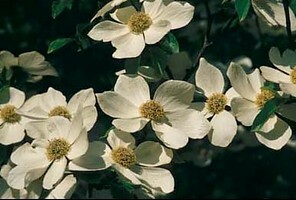 In fact, the rosids represent the largest remaining problematic group of angiosperms. For a more detailed discussion of the rosids, see D. Soltis et al. (2005). More representatives of the rosid clade, including the flowers of Euphorbia pulcherrima (Euphorbiaceae: Malpighiales: eurosids I; photo © Walter Judd), the flowers of the legume, Albizzia julibrisin (Fabaceae: Fabales: eurosids I; photo © Walter Judd), and the flower of Meriania brevipedunculata (Melastomataceae: Myrtales; photo © Walter Judd). Like rosids, asterids are a large clade, encompassing nearly one-third of all angiosperm species (80,000 species) classified in 114 families (Albach et al., 2001a; D. Soltis et al., 2005). However, unlike the rosids, a group of families corresponding closely to the asterid clade has been recognized on morphological grounds for over 200 years (de Jussieu, 1789; Reichenbach, 1828; Warming, 1879), and several morphological and chemical features appear to unite all or most asterids. Most notable are iridoid chemical compounds (e.g., Jensen, 1992), corollas with fused petals, unitegmic and tenuinucellate ovules, and cellular endosperm development; however, it is still unclear which of these features are actually synapomorphies for asterids (cf. Albach et al., 2001b; Judd et al., 2002). The asterid clade is broader than the Asteridae of recent classifications (e.g., Cronquist, 1981; Takhtajan, 1980, 1997) and includes also members of the polyphyletic subclasses Hamamelidae, Dilleniidae, and Rosidae (Olmstead et al., 1992, 1993, 2000; Chase et al., 1993; D. Soltis et al., 1997, 2000; P. Soltis et al., 1999; Savolainen et al., 2000a, b). Many relationships within asterids were resolved by angiosperm-wide molecular phylogenetic analyses, but asterids have since been analyzed in greater detail with more extensive taxon sampling and data from four (Albach et al., 2001a) and six (B. Bremer et al., 2002) loci. These studies confirmed earlier results indicating four major clades within asterids: Cornales and Ericales are subsequent sisters to all other asterids (euasterids), which comprise two large sister clades: euasterids I (lamiids) + euasterids II (campanulids). The Cornales and Ericales were not considered closely related to the Asteridae in previous classifications, and the families were typically placed instead in Rosidae and Dilleniidae, respectively. Euasterids are mostly united by flowers with epipetalous stamens that equal the number of corolla lobes and a gynoecium of two fused carpels. Within the euasterids, the euasterid I (or lamiid, B. Bremer et al., 2002) and euasterid II (or campanulid, B. Bremer et al., 2002) clades are sisters and can be distinguished both morphologically and molecularly (Albach et al., 2001a; K. Bremer et al., 2001; B. Bremer et al., 2002). 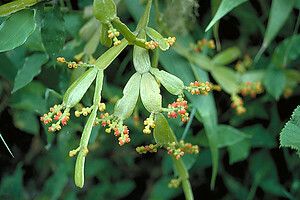 Most members of lamiids have opposite leaves, entire leaf margins, hypogynous flowers, "early sympetaly" with a ring-shaped primordium, fusion of stamen filaments to the corolla tube, and capsular fruits (K. Bremer et al., 2001). 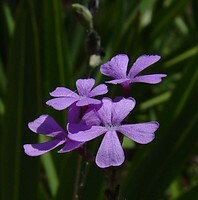 The lamiids comprise Garryales, Gentianales, Solanales, and Lamiales, plus Boraginaceae, Vahliaceae, and Oncothecaceae + Icacinaceae (APG II, 2003). 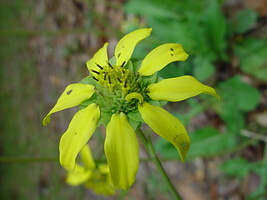 Most campanuliids have alternate leaves, serrate-dentate leaf margins, epigynous flowers, "late sympetaly" with distinct petal primordia, free stamen filaments, and indehiscent fruits (K. Bremer et al., 2001). It is unclear which of the characters that distinguish euasterids I and II are truly synapomorphies for these clades and which are symplesiomorphies; both reversals and parallelisms have contributed to complex patterns of morphological evolution in the asterids (Albach et al., 2001b; K. Bremer et al., 2001). The campanuliids are composed of Dipsacales, Aquifoliales, Apiales, and Asterales, plus Bruniaceae + Columelliaceae, a small clade of Tribelaceae, Polyosmaceae, Escalloniaceae, and Eremosynaceae, and possibly Paracryphiaceae. 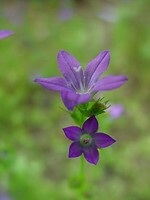 The campanulids include families previously classified in Asteridae and Rosidae (Cronquist, 1981, 1988). The asterids are covered in more detail in Judd et al. (2002), Judd and Olmsead (2004), P. Soltis et al. (2004), P. Soltis and Soltis (2004) and D. Soltis et al. (2005). 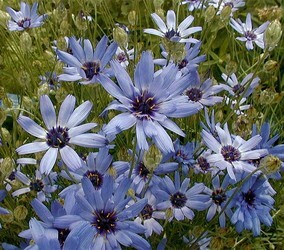 More representatives of the asterid clade, including the flower of Berlandiera subacaulis (Asteraceae: Asterales: euasterids II; photo © Paul Corogin), the flowers of Buchnera subacaulis (Apocynaceae: Lamiales: euasterids I; photo © Paul Corogin), and the flowers of Cornus nuttallii (Cornaceae: Cornales; photo © Matyas Buzgo). Barraclough, T. G., and V. Savolainen. 2001. Evolutionary rates and species diversity in flowering plants. Evolution 55:677-683. Bell, C. D., D. E. Soltis, and P. S. Soltis. 2005. The age of the angiosperms: a molecular timescale without a clock. Evolution, 59: 1245-1257. Bharathan, G., and E. A. Zimmer. 1995. Early branching events in monocotyledons-partial 18S ribosomal DNA sequence analysis. In P. J. Rudall, P. J., Cribb, D. F. Cutler, and C. J. Humphries [eds. ], Monocotyledons: systematics and evolution, 81-107. Royal Botanic Gardens, Kew, London, UK. Burleigh, G. G., and S. Mathews. 2004. Phylogenetic signal in nucleotide data from seed plants: implications for resolving the seed plant tree of life. American. Journal of Botany. 91: 1599-1613. Chaw, S. M., C. C. Chang, H. L. Chen, and W. H. Li. 2004. Dating the monocot-dicot divergence and the origin of core eudicots using whole chloroplast genomes. Journal of Molecular Evolution 58: 424-441. Clement, J. S., and T. J. Mabry. 1996. Pigment evolution in the Caryophyllales: a Systematic Overview. Botanica Acta 109: 360-367. DeCraene, L. P. R. 2004. Floral development of Berberidopsis corallina: a crucial link in the evolution of flowers in the core eudicots. Annals of Botany 94: 741-751. Doyle, J. A., and M. J. Donoghue. 1992. Fossils and seed plant phylogeny reanalyzed. Brittonia 44: 89-106. Doyle, J. A., and M. J. Donoghue. 1993. Phylogenies and angiosperm diversification. Paleobiology 19:141-167. Doyle, J. A., M. J. Donoghue, and E. A. Zimmer. 1994. Integration of morphological and rRNA data on the origin of angiosperms. Annals of the Missouri Botanical Garden 81:419-450. Judd, W. S., and R. G. Olmstead. 2004. A survey of tricolpate (eudicot) phylogenetic relationships. American Journal of Botany 91: 1627-1644. Kim, S., D. E. Soltis, P. S. Soltis, M. J. Zanis, and Y. Suh. 2004. Phylogenetic relationships among early-diverging eudicots based on four genes: were the eudicots ancestrally woody? Molecular Phylogenetics and Evolution 31: 16-30. Magallón, S., and M. J. Sanderson. 2005. Angiosperm divergence times: the effect of genes, codon positions, and time constraints. Evolution 59: 1653-1670. Martin, W., D. Lydiate, H. Brinkmann, G. Forkmann, H. Saedler, and R. Cerff. 1993. Molecular phylogenies in angiosperm evolution. Molecular Biology and Evolution 10:140-162. Nandi, O. I., M. W. Chase, and P. K. Endress. 1998. A combined cladistic analysis of angiosperms using rbcL and nonmolecular data sets. Annals of the Missouri Botanical Garden 85: 137-212. Nickrent, D. L., R. J. Duff, A. Colwell, A. D. Wolfe, N. D. Young, K. E. Steiner, and C. W. DePamphilis. 1998. Molecular phylogenetic and evolutionary studies of parasitic plants.In D. E. Soltis, P. S. Soltis, and J. J. Doyle [eds. ], Molecular systematics of plants, vol. 2: DNA sequencing, 488-507. Kluwer, Boston, Massachusetts, USA. Nickrent, D. L., and V. Malécot. 2001. A molecular phylogeny of Santalales. Pages 69-74 in A. Fer, P. Thalouarn, D. M. Joel, L. J. Musselman, C. Parker, and J. A. C. Verkleij, eds. Proceedings of the 7th. International Parasitic Weed Symposium. Faculté des Sciences, Université de Nantes, Nantes, France. Nickrent, D. L., and D. E. Soltis. 1995. A comparison of angiosperm phylogenies from nuclear 18S rDNA and rbcL sequences. 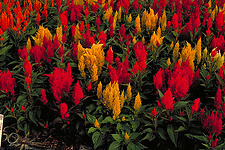 Annals of the Missouri Botanical Garden 82:208-234. Parkinson, C. L., K. L. Adams, and J. D. Palmer. 1999. Multigene analyses identify the three earliest lineages of extant flowering plants. Current Biology 9: 1485-1488. Oxelman, B., N. Yoshikawa, B. L. McConaughy, J. Luo, A. L. Denton, and B. D. I. Hall. 2004. RPB2 gene phylogeny in flowering plants, with particular emphasis on asterids. Molecular Phylogenetics and Evolution 32: 462-479. Sanderson, M. J., and M. J. Donoghue. 1994. Shifts in diversification rate with the origin of angiosperms. Science 264:1590-1593. Savolainen, V., M. W. Chase, C. M. Morton, D. E. Soltis, C. Bayer, M. F. Fay, A. De Bruijn, S. Sullivan, and Y.-L. Qiu. 2000a. Phylogenetics of flowering plants based upon a combined analysis of plastid atpB and rbcL gene sequences. Systematic Biology 49: 306-362. Soltis, D. E., P. S. Soltis, M. E. Mort, M. W. Chase, V. Savolainen, S. B. Hoot, and C. M. Morton. 1998. Inferring complex phylogenies using parsimony: an empirical approach using three large DNA data sets for angiosperms. Systematic Biology 47: 32-42. Soltis, D. E., P. S. Soltis, M. W. Chase, and P. K. Endress. 2005. Angiosperm phylogeny and evolution. Sinauer Associates, Inc., Sunderland, Massachusetts, USA. Soltis, D. E., V. A. Albert, V. Savolainen, K. W. Hilu, Y-L. Qiu, M. W. Chase, J., S. Farris, S. Stefanovic, D. W. Rice, J. D. Palmer, and P. S. Soltis. 2004. Genome-scale data, angiosperm relationships, and "ending incongruence": a cautionary tale in phylogenetics. Trends in Plant Science, 9: 477-483. Soltis, P. S., D. E. Soltis, and M. W. Chase. 1999. Angiosperm phylogeny inferred from multiple genes as a tool for comparative biology. Nature 402: 402-404. Stebbins, G. L. 1974. 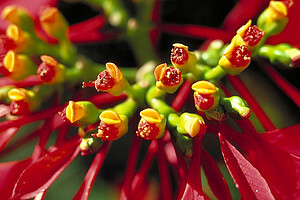 Flowering plants: evolution above the species level. Harvard University Press, Cambridge, Massachusetts, USA. Sytsma, K. J., and D. A. Baum. 1996. Molecular phylogenies and the diversification of angiosperms. In D. W. Taylor and L. J. Hickey [eds. ], Flowering plant origin, evolution, and phylogeny, 314-340. Chapman and Hall, New York, NY, USA. Takhtajan, A. 1991. Evolutionary trends in flowering plants. Columbia University Press, New York, NY, USA. Takhtajan, A. 1997. Diversity and classification of flowering plants. Columbia University Press, New York, NY, USA. Taylor, D., and L. Hickey. 1992. Phylogenetic evidence for the herbaceous origin of angiosperms. Plant Systematics and Evolution 180: 137-156.
Zimmer, E. A., R. K. Hamby, M. L. Arnold, D. A. LeBlanc and E. C. Theriot. 1989. Ribosomal RNA phylogenies and flowering plant evolution. In B. Fernholm, K. Bremer and H. Jornvall [eds. ], The hierarchy of life, Pp. 205-214. Elsevier, Amsterdam, the Netherlands. 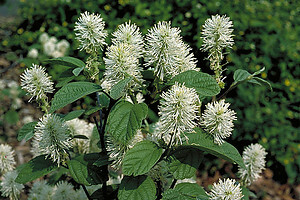 Thonner's analytical key to the families of flowering plants. 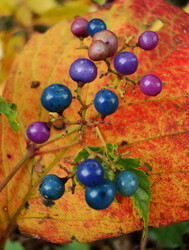 This fast-growing alien from Northeast Asia, is in the Grape family (Vitaceae). Thanks to Walter Judd, Paul Corogin, Sangtae Kim, Matyas Buzgo, and Scott Zona for use of their wonderful images.